46. The Approved School Rules authorize the infliction of corporal punishment by a cane or tawse under specified conditions. 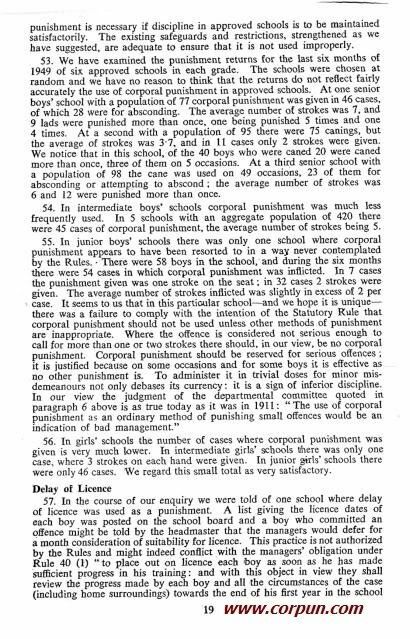 Boys of 15 and under may be given not more than three strokes on each hand with a cane; boys under 15 may be given not more than six strokes on the seat with cane or tawse; boys of 15 and over may be given eight strokes, or exceptionally, with the consent of the managers, twelve strokes. Girls under 15 may be punished with not more than three strokes on each hand. 47. In addition the principal teacher of the school may be authorized by the managers to inflict corporal punishment for minor schoolroom offences; the maximum that may be given is two strokes with the cane on each hand. 48. The Rules require a cane or tawse of a type approved by the Secretary of State to be used. We understand that the tawse is no longer used in English and Welsh schools and a sample was not produced for our inspection. The types of cane in use were approved in 1933 and are issued by the Home Office. There are four grades: one for senior boys, one for intermediate boys, one for junior boys, one for girls under 15. We have examined these canes and think they are adequate for their purpose. Certainly none of them could be considered a brutal weapon. Our only criticism is that the cane used in senior boys' schools is too thick and rigid and is more likely to cause bruises than pain. We accordingly recommend that a longer cane of slightly smaller diameter be substituted for the pattern at present in use in senior boys' schools. 49. The safeguards against the excessive use of corporal punishment in approved schools are considerable. Every case where corporal punishment is inflicted must be recorded immediately in the punishment book which every school must keep. This book must be inspected regularly by the managers and the school medical officer and a return made quarterly to the Home Office. Moreover inspectors visiting the schools regularly examine the punishment book and call for an explanation of any cases where the punishment appears excessive or irregular. 50. An important safeguard against the misuse of corporal punishment is the provision that no boy or girl who is suffering from any physical or mental disability may be caned without the approval of the medical officer. We have been assured that no headmaster or headmistress inflicts corporal punishment on any boy or girl who is not a suitable subject for it. There was some evidence, however, that boys in a remand home who had received repeated corporal punishment were mentally abnormal. 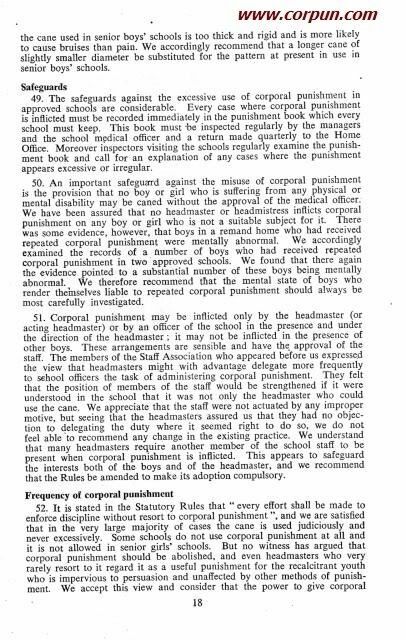 We accordingly examined the records of a number of boys who had received repeated corporal punishment in two approved schools. We found that there again the evidence pointed to a substantial number of these boys being mentally abnormal. We therefore recommend that the mental state of boys who render themselves liable to repeated corporal punishment should always be most carefully investigated. 51. Corporal punishment may be inflicted only by the headmaster (or acting headmaster) or by an officer of the school in the presence and under the direction of the headmaster; it may not be inflicted in the presence of other boys. These arrangements are sensible and have the approval of the staff. The members of the Staff Association who appeared before us expressed the view that headmasters might with advantage delegate more frequently to school officers the task of administering corporal punishment. They felt that the position of members of the staff would be strengthened if it were understood in the school that it was not only the headmaster who could use the cane. We appreciate that the staff were not actuated by any improper motive, but seeing that the headmasters assured us that they had no objection to delegating the duty where it seemed right to do so, we do not feel able to recommend any change in the existing practice. We understand that many headmasters require another member of the school staff to be present when corporal punishment is inflicted. This appears to safeguard the interests both of the boys and of the headmaster, and we recommend that the Rules be amended to make its adoption compulsory. 52. It is stated in the Statutory Rules that "every effort shall be made to enforce discipline without resort to corporal punishment", and we are satisfied that in the very large majority of cases the cane is used judiciously and never excessively. Some schools do not use corporal punishment at all and it is not allowed in senior girls' schools. But no witness has argued that corporal punishment should be abolished, and even headmasters who very rarely resort to it regard it as a useful punishment for the recalcitrant youth who is impervious to persuasion and unaffected by other methods of punishment. We accept this view and consider that the power to give corporal punishment is necessary if discipline in approved schools is to be maintained satisfactorily. The existing safeguards and restrictions, strengthened as we have suggested, are adequate to ensure that it is not used improperly. 53. We have examined the punishment returns for the last six months of 1949 of six approved schools in each grade. The schools were chosen at random and we have no reason to think that the returns do not reflect fairly accurately the use of corporal punishment in approved schools. 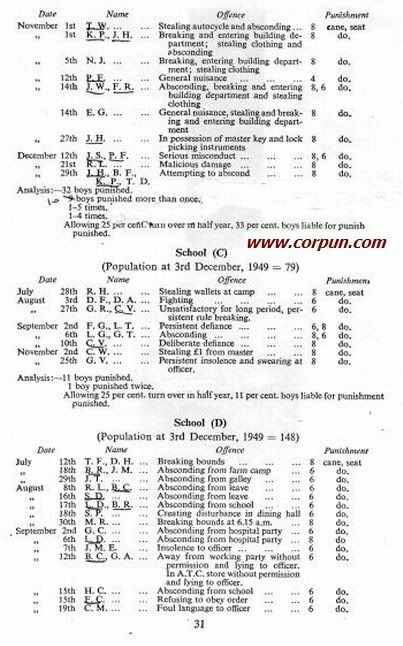 At one senior boys' school with a population of 77 corporal punishment was given in 46 cases, of which 28 were for absconding. The average number of strokes was 7, and 9 lads were punished more than once, one being punished 5 times and one 4 times. At a second with a population of 95 there were 75 canings, but the average of strokes was 3.7, and in 11 cases only 2 strokes were given. We notice that in this school, of the 40 boys who were caned 20 were caned more than once, three of them on 5 occasions. At a third senior school with a population of 98 the cane was used on 49 occasions, 23 of them for absconding or attempting to abscond; the average number of strokes was 6 and 12 were punished more than once. 54. In intermediate boys' schools corporal punishment was much less frequently used. In 5 schools with an aggregate population of 420 there were 45 cases of corporal punishment, the average number of strokes being 5. 55. In junior boys' schools there was only one school where corporal punishment appears to have been resorted to in a way never contemplated by the Rules .. There were 58 boys in the school, and during the six months there were 54 cases in which corporal punishment was inflicted. In 7 cases the punishment given was one stroke on the seat; in 32 cases 2 strokes were given. The average number of strokes inflicted was slightly in excess of 2 per case. It seems to us that in this particular school -- and we hope it is unique -­ there was a failure to comply with the intention of the Statutory Rule that corporal punishment should not be used unless other methods of punishment are inappropriate. Where the offence is considered not serious enough to call for more than one or two strokes there should, in our view, be no corporal punishment. Corporal punishment should be reserved for serious offences; it is justified because on some occasions and for some boys it is effective as no other punishment is. To administer it in trivial doses for minor misdemeanours not only debases its currency: it is a sign of inferior discipline. 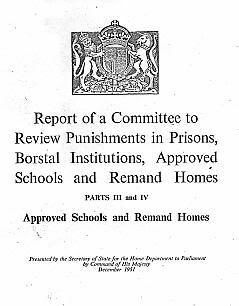 In our view the judgment of the departmental committee quoted in paragraph 6 above is as true today as it was in 1911: "The use of corporal punishment as an ordinary method of punishing small offences would be an indication of bad management." 56. In girls' schools the number of cases where corporal punishment was given is very much lower. In intermediate girls' schools there was only one case, where 3 strokes on each hand were given. In junior girls' schools there were only 46 cases. We regard this small total as very satisfactory. 71. Under Rule 37 every headmaster is responsible for immediately recording all corporal or other serious punishments in the school punishment book. All approved schools are also required to send in a quarterly punishment return to the Chief Inspector of the Children's Department. A special form is provided with headings: DATE, NAME, AGE, OFFENCE, BY WHOM REPORTED, PUNISHMENT, BY WHOM AUTHORISED, REMARKS. In recording corporal punishment the schools are required to state the instrument used, the number of strokes, and on what part of the body they were inflicted. In recording separate confinements, the period of confinement must be stated. Space is also provided for recording details of any breach of the punishment rules and any special or unusual circumstances affecting the tone or discipline of the school. Once a year there is required a brief statement of the form taken by minor punishments in the school. Whenever a boy or girl is transferred to another school as a result of unsatisfactory conduct the facts are to be stated in the return. The headmaster or headmistress and one manager are required to certify on this form that to the best of their knowledge "the entries within are a correct and complete record of all corporal punishment (other than punishment in the schoolroom), and of all other individual and collective punishments, except those of a trivial nature", and that the school's punishment book is complete and has been examined. These returns, supplemented by visits to the schools at least three times a year and examination of the school punishment books, enable the inspectors of the Children's Department to have a fair picture of the punishment position in every school. The returns are carefully scrutinized and any instances of excessive punishment noted for discussion at the next visit. Any irregular punishment is also noted and if it has not already been reported by the school and appropriately dealt with by the managers arrangements are made by the Home Office for an immediate investigation. It is possible for irregular punishment to be discovered from the punishment returns; from a scrutiny of the punishment book; by a visiting inspector talking to the boys, the staff or the managers, or from a letter received by the school, the managers, the Home Office or a member of Parliament from a boy or his parents or some other interested person. Wherever there is any suggestion, from whatever source, of an irregularity having occurred the managers are asked by the Home Office to hold an enquiry, and a representative from the Home Office may be present. When a medical inspector from the Home Office visits a boys' school a stripped inspection of a number of children is sometimes made, and any marks of corporal punishment are noted and checked with the records. Similar inspections of every child are held at least once a quarter by the school's medical officer. All these checks are a great safeguard against children in the schools being ill-used, and also a protection to the staff against false accusation. Irregularities will inevitably occur from time to time, but we do not consider it possible to provide any further safeguards than those which already exist. 72. 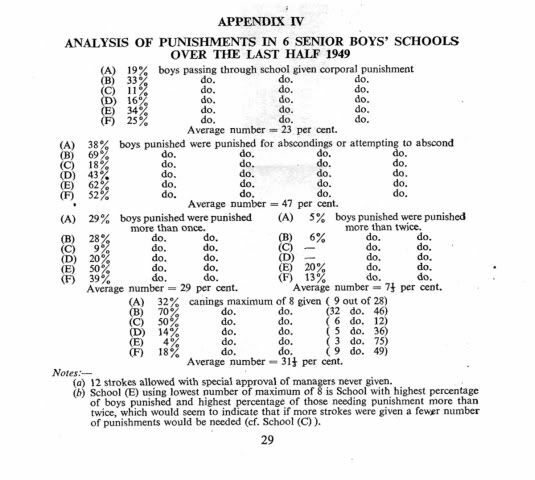 We have examined the punishment returns for the last half of 1949 for six approved schools in each age group chosen at random. An analysis of the position in these 36 schools is attached to our report as Appendix IV. We find that in most boys' schools corporal punishment is the only serious form of punishment used, and that in their returns punishments other than corporal are seldom included. As we have pointed out above the schools are required to state once a year the form taken by other minor punishments, and this is checked by the inspectors to ensure that only appropriate methods of punishment allowed by the Rules are being used. Minor punishments in boys' schools usually take the form of loss of conduct money and privileges, such as outings and cinema shows, the giving of housework such as peeling potatoes during free time, and the loss or restriction of home leave. 27. The 1909 Rules allowed the responsible head of a place of detention to give moderate personal correction, i.e., corporal punishment. 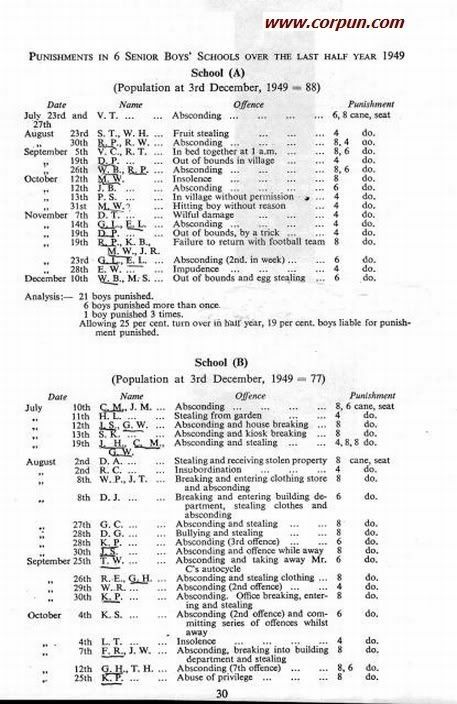 The 1933 Rules limited this to boys, the superintendent being required to record the punishment immediately in the Log Book. 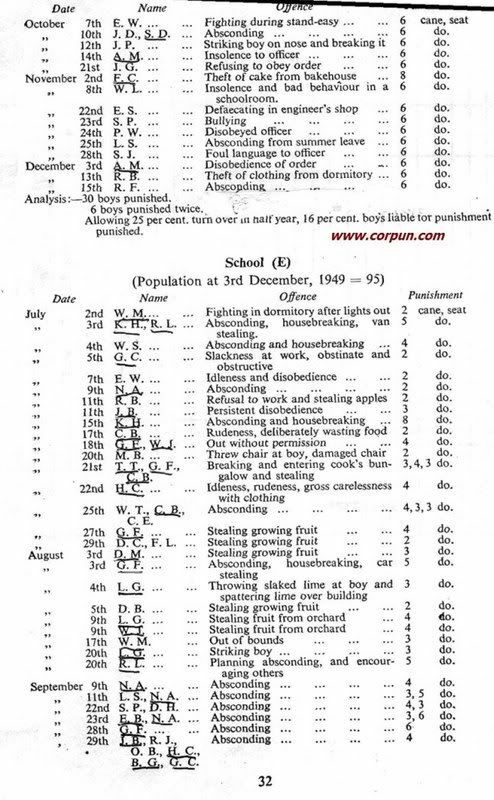 When the 1939 Rules were being drawn up it was suggested that corporal punishment for girls of school age might be allowed, as it is in approved schools. The opinion, however, of remand home authorities, including superintendents of girls' remand homes, was found to be overwhelmingly opposed to its being again introduced, and its use is accordingly prohibited in the present Rules. We have heard no criticism of the Rule and no suggestion that a change may be desirable; we therefore recommend that it should stand. 28. The amount of corporal punishment used in remand homes does not seem to be excessive. In 1949 only 7 per cent. of the boys committed were so punished. We found that 98 per cent. of superintendents favoured the power to use it being retained, and that some of its strongest advocates were men who used it most sparingly. It is felt that the knowledge that a cane can if necessary be used has a salutary effect on discipline. We agree with this view and recommend that corporal punishment in boys' homes be retained, provided there are adequate safeguards against its abuse. 29. The 1939 Rules defined for the first time "moderate personal correction". Rule 14 (iv) states "Every effort shall be made to enforce discipline without resort to corporal punishment.". There follow rules for its application, the first of which provides that it shall be inflicted only with a cane or similar instrument approved by the council. We understand that the words "or similar instrument" remain in the Rules because at one time a tawse was used in some remand homes; now only a cane is used. We recommend that the words "or similar instrument" be deleted from Rule 15 (a). 30. Not more than three strokes on each hand or six on the seat over the boy's ordinary cloth trousers are allowed. The punishment returns in Appendix IV seem to indicate that caning on the hand is rarely used, as no example of it appears in those six boys' homes chosen at random. The maximum of six strokes is not infrequently given for absconding and breaking and entering. We do not consider that the number of strokes allowed is excessive. 31. When the 1939 Rules were made, an accompanying circular was issued to all local authorities on 10th February, 1939. This recommended that when corporal punishment was necessary it should be inflicted in the presence of another member of the male staff: The circular stated, "This is a safeguard against any subsequent allegations regarding the manner in which corporal punishment has been administered.". We agree with this recommendation and consider that it should be included in the rules. We accordingly recommend that an addition to Rule 17 should be made after the first sentence as follows: "A second member of the male staff shall be present.". 32. It seems to us that a further amendment is needed under Rule 15 to ensure that, as in approved schools, corporal punishment is not administered in the presence of other boys. We understand that the inspectors emphasize to superintendents the undesirability of its being so administered, but feel that this should be enforced by a provision of the Statutory Rules. We accordingly recommend that there should be inserted: "Rule 15 (d): it shall not be inflicted in the presence of other boys.". 33. All punishments, including corporal punishment, must be recorded immediately in the Log Book and a quarterly return of corporal punishments sent to the Chief Inspector. If in this way or at visits any excessive punishment is revealed the council is notified and an investigation called for. Some boys' remand homes, as we have already observed, include punishments other than corporal in their quarterly returns (see Appendix IV). It appears to us that, since separation is rightly regarded as a serious punishment, it would be wise to make its inclusion compulsory in the quarterly returns. We accordingly recommend that the last sentence of Rule 17 be amended to read: "and a return of the corporal punishments and punishments of separation administered, including the period of separation, shall be made quarterly to the Chief Inspector in such form as he may require.". 34. We agree with the provisions of Rule 17, which allows corporal punishment to be administered only by the superintendent, or in his absence by the responsible officer in charge of the home; and forbids all forms of striking, cuffing, shaking and other corporal punishment, not authorized by the Rules. These are necessary precautions. We are informed that breaches of these Rules do not often occur; when infringements are revealed -- at inspectors' visits, from a scrutiny of the Log Book or punishment returns, or by a complaint being made -- they are investigated by the local authorities and the Home Office. No procedure is laid down, as it is for approved schools, for enquiring into complaints against the staff; each council is free to follow its own procedure. We have heard during our enquiry no suggestions of injustice or inadequate investigation, and understand that both the staff and the Home Office are satisfied with present arrangements. 35. We are not satisfied that adequate safeguards exist in remand homes to prevent boys with physical or mental disabilities from being given corporal punishment that may be harmful to them. It is laid down in the approved school rules that no boy with such disabilities should be given corporal punishment without the sanction of the medical officer. The punishment book must be shown to the medical officer at least once a quarter. No such safeguards exist in remand homes. The present position is that the local authority is required to appoint a medical officer at every remand home and these homes are visited by medical inspectors from the Home Office. The medical officer is required to give regular attendance and to supervise the health of the boys and girls; further, a medical examination must be given within 24 hours of admission, or in cases of difficulty within 48 hours. A further medical examination may be given at any time if the medical officer or superintendent considers this necessary; but nowhere in the Rules is the medical officer asked to concern himself in any way with the methods of punishment that are used. An analysis of the punishment returns of a large London remand home, where careful and skilled psychiatric observation was possible, showed that a high proportion of the boys receiving repeated corporal punishment were mentally abnormal. We understand that many superintendents do in fact consult the medical officer if they are in doubt about the suitability of any form of punishment for a particular child, but we do not consider this to be a sufficient safeguard. We accordingly recommend that a further addition be made to Rule 15 as follows: "Rule 15 (e): No boy with any known physical or mental disability shall be so punished without the sanction of the medical officer." ; and that the last sentence of Rule 17 should be amended as follows: "All punishment (corporal and other) shall be recorded immediately in the Log Book required to be kept under Rule 23; this book shall be shown to the medical officer at least once a month.". The Rule should end as we have recommended in paragraph 33.